Easter falls on April 21, 2019, but holiday activities and events in New York City take place over the weekend from Good Friday, April 19, through Easter Monday, April 22. Whether you're looking for unique "only-in-New-York" experiences or more traditional religious ceremonies, you're sure to find them in the Big Apple. There are long-standing traditions like parades and bonnet pageants. Restaurants also have Easter feasts. Easter is a popular time to visit New York City, in part because so many schools and colleges have a long weekend or a full week off from spring. Be prepared for crowds. The good news is the weather should be nice. In late April spring has finally arrived in New York City and temperatures are milder. 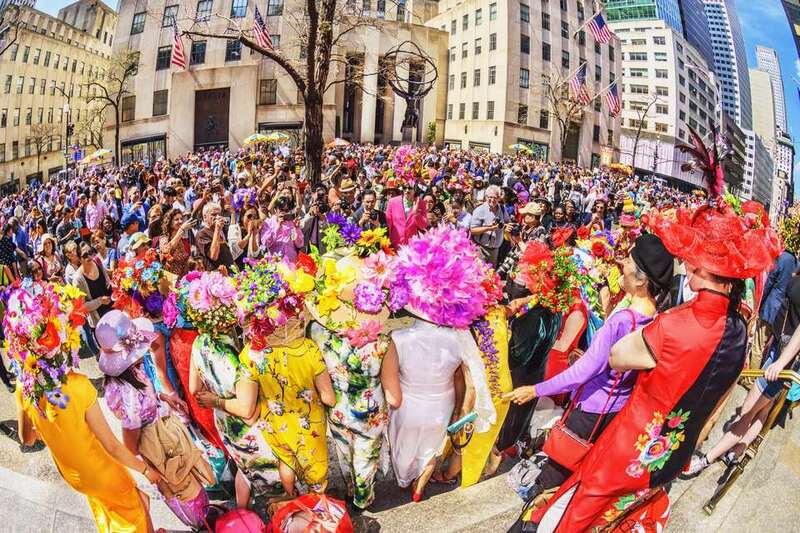 On Easter Sunday thousands of people parade down Fifth Avenue for the Easter Parade and Easter Bonnet Festival. Many participants are dressed in elaborate costumes; some people even dress up their dogs. If you want to join in the fun there is one rule: Make your costume (don't forget about head pieces!) as over-the-top and picture-worthy as possible. Rather than this being a parade, it's more of a gathering on Fifth Avenue. Most people are congregated near St. Patrick's Cathedral. People pop in and out of the fun even shopping or stopping at restaurants along the way. You can show up anytime from 10 am to 4 pm and you'll see the spectacular crowds. New York City is one of the best food destinations in the world. It has an array of international delicacies as well as all-American restaurants. Many of the city's top restaurants offer East brunch or dinner over Easter weekend. Gotham Bar and Grill, a West Village stable, serves an all American meal in an intimate setting. Morandi, a restaurant close by, serves modern takes on Italian food in a spacious, airy setting (if it's nice weather sit outside!) Le Caprice is a great option for those looking to dress up and go fancy for the holiday. Saint Patrick's Cathedral is one of the most famous churches in the City. On Easter Sunday they have eight services, including one in Spanish. Only one requires reservations in advanced. But that isn't your only option. St. Pauls' Chapel at the Trinity Church in Lower Manhattan hosts the Great Vigil of Easter on Saturday evening each year as well as Easter services on Sunday in both the church and chapel. Saint Thomas Church in Midtown also offers three services on Easter Sunday: a solemn Eucharist, an organ recital, and a solemn evensong. One of the most fun Easter activities in New York City is the Easter Egg Hunt. In this city both people you and old participate, enjoying every minute of the fun. The Children's Museum of Manhattan stages a creative easter egg hunt where they hide treats all over the museum. Kids learn as they hunt for them. The New York City Fire Museum holds a hunt around the firehouse. Kids can even crawl on fire trucks to find them! For outdoor festivities head to one of the many parks in Manhattan from Riverside Park to Carl Schultz Park. Park organizations hold these fun events for families, and they are free and open to the public. There is annual Easter cruise called the Easter Bunny Kids Party Cruise. It takes place on the East River, and entire families - along with the Easter bunny - sail the high seas. In addition to seeing sites like Lady Liberty, you'll be able to hunt for eggs on the boat. There are also clowns, magic shows, face painting, and more. There are two trips per day for the entire Easter weekend. Book early; last year many of the cruises sold out.